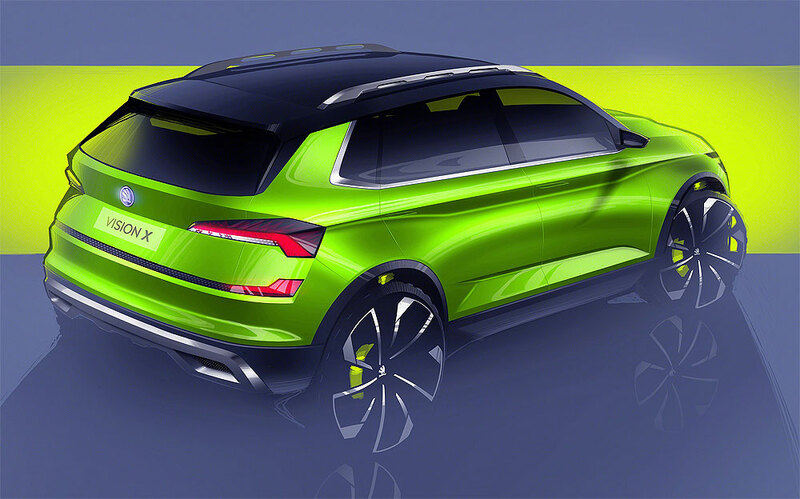 Skoda is presenting an outlook on the further development of their model range with the hybrid study "Skoda Vision X". The concept of the urban crossover transfers the characteristic features of Skoda´s SUV models to another vehicle segment. The Vision X is celebrating its world premiere at the International Motor Show 2018 in Geneva. The study is coming with compact proportions, precise lines and clear surface contours characterise the exterior and highlight the dynamic character of the FlexGreen-painted hybrid crossover. A roof in contrasting Anthracite sets sporty accents. In addition, distinctive bumpers, dominant side sills, a large panoramic glass roof and 20-inch alloy wheels create a powerful look. The sharp design was inspired by traditional Czech glasswork. The interior of the Vision X defines a new design language. The wide, ergonomically contoured dashboard with freestanding colour display dominates the visual impression in the interior. The infotainment and connectivity services can be accessed quickly and intuitively via the screen. Illuminated elements made of cut crystal glass in conjunction with the colour display create atmospheric lighting effects. The Vision X is the Czech automobile manufacturer’s vision of a modern crossover. Expanding the range of models with a focus on the fast-growing SUV segment is a cornerstone of Skoda´s Strategy 2025. By 2025, Skoda Auto will have brought out plug-in hybrid vehicles in addition to all-electric cars. Then, every fourth vehicle the brand delivers worldwide will have a plug-in hybrid or purely electric powertrain.